Thank You to all those who showed up for the hearing and submitted comments. The turnout for the hearing on Thursday night was huge! Due to the quantity of testimony, the hearing continued into Friday and took up the entire day, from 10 AM till 5 PM. Legal testimony continued for another 2 days, wrapping up on Monday April 8. 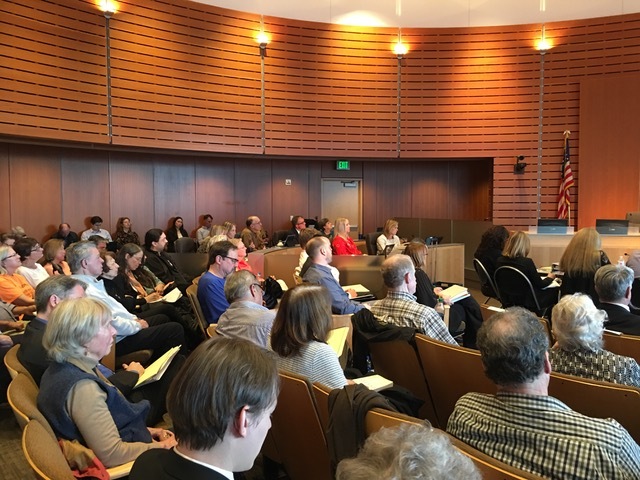 Energize Eastside proponents were prevalent during the first evening session, but sincere and well-informed residents dominated Friday, bolstered by excellent testimony from CENSE and CSEE. CENSE’s lawyer, expert witnesses, and president Don Marsh provided convincing facts against the project. Former PSE vice president and power planner Richard Lauckhart delivered a clear explanation of how PSE’s justification is flawed. The Hearing Examiner was engaged, asked good questions, and seemed critical of the project. Read complete details of the proceedings on the hearing report. What’s next? The Hearing Examiner will review the thousands of pages of testimony and public comment to reach a decision. His decision will be made public by May 15th at the earliest, but likely later than that. The decision is likely to be appealed to the Bellevue City Council by PSE or CENSE, depending on the outcome. Check back later or sign up for our newsletter for breaking news. The CENSE legal notebook is a critical element in CENSE’s testimony. 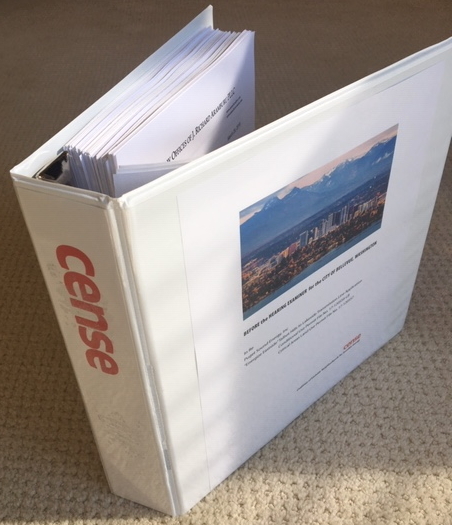 Since CENSE had only a short time to present its case, the notebook provides the Hearing Examiner with extensive detail to back up the oral testimony. The Hearing Examiner stated that he was impressed with the notebook and its excellent organization. Countless hours by CENSE volunteers and expert witnesses went into writing, compiling, and printing the notebook. To view the contents or download the entire notebook, go to our Legal Notebook page. Read a detailed Hearing summary of all 3 days of the hearing. What was this hearing all about? PSE must submit building permits in each city impacted by Energize Eastside. Each city holds a public hearing to review the application and its adherence to city building codes (e.g. Land Use Code). Each city appoints a Hearing Examiner (Administrative Law Judge) to conduct a hearing, listen to testimony, review the evidence, and issue a decision. Also the hearing will create the legal record for the project that will become the basis for subsequent appeals to city councils or the courts. 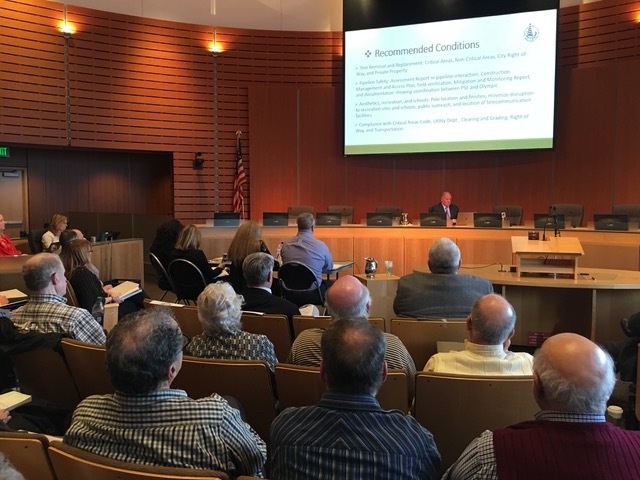 The Public Hearing held on March 28 thru April 8 was Bellevue’s hearing. Additional hearings will take place in the other cities through which the transmission line passes. The focus of this Hearing was for PSE to present its case for the Application. For that reason, by Hearing guidelines, opponents CENSE and CSEE were limited in the amount of time to orally present their side. Hence, the importance of the CENSE legal Notebook which is now part of the record. Bellevue City Staff Report to hearing examiner recommending approval of Energize Eastside permits (PDF, 6.3MB, 151 pages). 1) Upper level parking is for visitors and is accessible from 110th Av NE. It is small so it may fill up early. 2) The lower East Employee Garage (P2 level) is bigger and can be accessed from 112th Avenue NE between 6th and 4th.